How about that yesterday? My blog went from a fun project I barely keep up while I work on finishing my book about my 20 years following US Soccer, to one of the most talked about thing in the soccer world. It would have been a fun day to have the One Goal and Kick TV guys shooting their documentary style, and I ran back and forth between helping my kids painting all afternoon (it would be early-out school, the day my blog blows up) and keeping up with twitter and comments on my blog. My keyboard, phone and ipad are all covered in paint, but kids made art, and we all survived. Now how do I follow yesterday? I mean, it was fun, getting ping backs from Prost Amerika referencing my “quaintly named” blog. I got really funny texts from friends like “Do you know Bill Archer? because he’s calling you a b*tch on Big Soccer” Yeah, I’m not linking to you, Bill. If you were a real journalist, you wouldn’t call women with opinions names, and if you felt that was the only way you could communicate yourself, you’d do it to me here, to my face. I have no time for trolls like you, except to call you out on your cheap misogyny. Go sit with Simon Borg and think about what you’ve done. Now then…I enjoyed Dan Loney’s blog as on point and funny, plus, the twist of calling a Jewish woman’s blog gospel. So many of you have entertained me, but I think the best part for me was the ongoing conversation with Devin Cathcart, aka @ClevelandGooner. The discussion of whether or not we should have capo leadership is one I really didn’t cover on my blog yesterday, but it was an interesting discussion yesterday, on that made me realize that I swear I wrote a blog about my past experiences in Columbus, but I apparently never published it. I’ll summarize: I was in Columbus last year, as I was in 2009 and 2005 (I missed 2001 due to career stuff…a mistake I vowed never to make again, so I wasn’t there, but I shifted my priorities because of it). Last year was the best of all three of those games, and one of those games that will forever stand out among my 40+ caps. It will go down in history as the first time I ever saw an entire stadium of people stand for the full 90 minutes. They often cheered, sometimes in something close to unison. It brought tears to my eyes, that America had finally arrived. I finally saw a game, where the entire stadium was on some level, supporting the team I love. Let that sink in, Columbus. I love you guys. In the book I’m writing, you’re a major character. When I was a referee traveling to Warrior Classic in the 90s, I used to love coming to Crew games. Because you have always had a great environment. And Frankie Hejduk. Have I mentioned how much I’ve always loved Frankie, and his mom, who let me cut the ladies room line when I was 5 months pregnant in Korea? Read my book (I’ll finish it soon, promise) and you’ll see, my feelings for Columbus are nothing but love. For everyone of you, who passionately want to bring it on your home field for USMNT, there are people like me, who will never get to host, but still want to be a part of the action. It’s part of why we bought the Midwest Mama flag and schlep it around the country. I may never get to host, but I can bring the flag, and I can capo. I like capos, but when I capo at Menace games, I do it from the back row, because, there’s like 30 of us. Maybe. Those of us who travel want to experience your local flavor, but we also want to bring our experience to the match and share it. I don’t think any of us want to share it in a bossy, take-this-thing-over way (well, maybe Seattle…I roll my eyes…it’s not that they don’t have good ideas, it’s that they feel they must bludgeon you into submission with their ideas. Not really my style). I’ve never stood on a podium (although there was a running joke about building one for the Menace last year, just to be silly). I’m not coming to take over what you do, and I don’t support anyone else who wants to either. I’m coming to express my mad love for what you do, help support what you do, because what you do is glorious. I regret that anyone ever made you think otherwise. It has always been my hope that the negative blogs that were out there were untrue, because you deserve tons of respect for what you do. I look forward to seeing you all again, and coming together in the biggest supporter’s section ever, and dwarfing what we all did together last year. I hope you’ll accept my offer to help make the section the best it can be, because traveling to places like Columbus and learning from other hosts are what make the Menace supporters the talk of the PDL. You Want to Capo in Columbus? Step Up. Remember when American Outlaws did their National Capo search? Hardly anyone responded, so they scrapped it. Remember when AO National posted on their leader board four days ago that they were looking for volunteers to capo in Columbus? They got eight people to respond. Yes, two were from Seattle. You know who the first response was from? THIS GIRL. I will be a capo in Columbus, and I’m not from Seattle. I’m not even from an MLS market, but I love US Soccer, and I capo the heck out of my little Des Moines Menace PDL world. Since you’re not all on the leader board, I’ll share this with you, as your chapter leader should have already discussed with you from 8/24: “Chapter Leaders – If you or any of your members are interested in being a section capo in Columbus, please let me know via email. We need 14 capos for this game. We are looking for people that will be able to lead the section and follow and communicate with the main capo initiating the stand chants. ***Just a reminder if you are selected to be on the section capo stand, you will be following the main capo stand. We are doing this so all of the supporter sections are on the same page with chants. Deadline for this is on Tuesday [8/27] by 5 pm PT. We will select and get back to you via email. It’s not all Seattle show in Columbus, and anyone who tells you so is pretty much full of it. I’m not from Seattle, and frankly, I wish they wouldn’t make themselves so hard to like, but I will work with those 2 Seattle capos just like I will work with anyone else who will put themselves up there. IF YOU WANT TO CAPO IN COLUMBUS, STEP UP. We need six more capos there, according to Brian Hexsel as of a few minutes ago. So stop kvetching about Seattle and volunteer. Unite and Strengthen. If you can’t play nicely with your brothers and sisters I will send you all to your rooms. Stop making Mama want to drink before lunch. 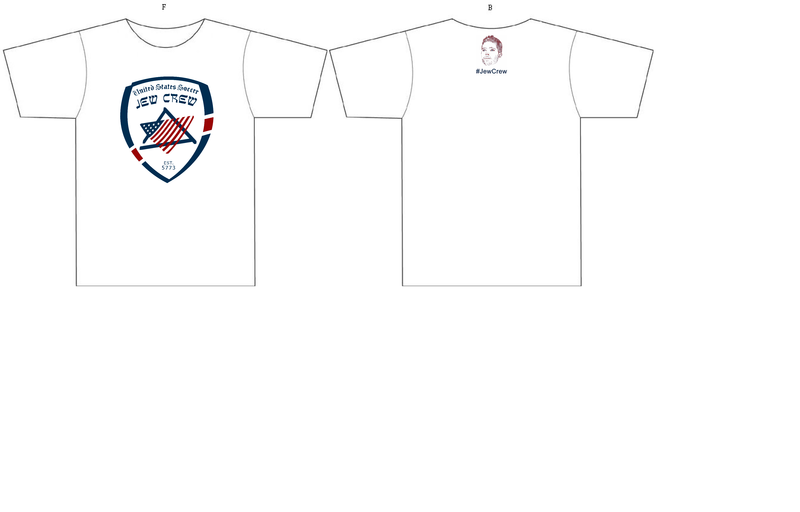 You’re Jewish, and You Love US Soccer….And Now You Have a Shirt! A while back, I met a few fellow Tribe members at a pre-game meet up, and thus began a string of running jokes referenced with the hashtag #JewCrew. We joked about our tiny group one day getting to minyan at a game (10 adult Jewish fans), about tailgate kashrut, the merits of MoT players past and present. Fine times were had by all. Then one day, Matt Dziomba overheard one such conversation on a Facebook group, and in no time, had come up with the logo you see here. It’s a brilliant little take off on the Israel Football Association logo. The logo was a hit on Twitter, and the first #JewCrew t-shirt was born. If you want one, you need to fill out this order form and send your money by Monday, 8/19. Choose all cotton or tri-blend (similar to American Apparel) and your size and it’ll be on the way before Columbus! Big time thanks to Matt for taking this to the next level!